Green or raw peanuts make a delicious edamame-like snack when boiled in a brine. Use this spicy five spice boiled peanut recipe to make them at home. Green peanuts are really just fresh raw peanuts straight from the ground (before they’ve been salted, dried or roasted). If you’ve never had a boiled green peanut, they’re closer in spirit to edamame than the dry roasted variety sold by the monocled peanut. They’re not actually green, but the name is a disambiguation for the term “raw peanut” which can include dried roasted peanuts. Honestly, I’m not sure why these things aren’t in the freezer aisle alongside edamame, because they’d be flying off the shelves if they were. The fresh nuts are more crispy than crunchy with a mild creamy flavour. Paired with the Chinese spices in this brine, they make for a delicious snack with a crack-like addictive quality that keeps your hand going back for more. What’s your favourite way of having peanuts? While I’d originally seen the idea of boiled peanuts on Red Cook’s blog last year, I never got around to buying any until this weekend. It all started with a bag of five spice laced brine, which I’d mixed for some pork chops I was planning to make for dinner. In the latest chapter of my love-hate saga with Whole Foods, the hero (that’s me!) unwrapped the eco-friendly butcher paper and was confronted by the foul stench of rotting meat. I was irked by the fact that I had to throw out two chops I’d purchased but one day earlier, especially since this wasn’t the first time this has happened (Whole Food’s are you listening?). What really got my goat though was the fact that I’d already mixed the brine. I couldn’t bear to throw another thing out, so I tossed the bag in the fridge and headed up to Chinatown in search of some replacement meat (hormone laden as it may be, I’ve never been sold spoiled meat in Chinatown). As I walked down the south side of Canal street, I noticed the cart vendors had green peanuts for $2 a pound. Lightbulb flashing, I bought a pound of them and decided to repurpose the brine to cook the hourglass shaped beauties. Back at home I used Kian’s cooing method along with my brine to boil the peanuts. I tasted a few last night, but they were bland and unmemorable, so I left them in the brine overnight as Kian instructs to see if they’d be better in the morning. I woke up and headed straight for the stock pot this morning. Cracking open a peanut, I found two satisfyingly salty, plump peanuts, which were promptly redirected into my mouth. It didn’t take long before I moved the whole pot over to the table and was popping one after the other, until table was littered with shells, and my hands and face were covered in brine from the shells, which have a tendency to squirt. Thoroughly rinse any extra dirt off the peanuts. Add all the ingredients into a covered pot and bring to a boil. Turn down the heat to a simmer and cook for about 30 minutes. Turn off the heat and let the peanuts sit in the brine overnight. ahhh, this is delish! you can often find these at Chinese tea egg stalls in night markets in Singapore. they smell really good from being boiled in broth and the peanuts simple melt in your mouth. there’s a little crunch on the outside but once you bite into it, it kinda resembles really good mash. love it!! Ah, this is my favorite childhood junkfood. There were boiled peanuts mobile stalls that sell these in Penang and my parents loved to buy them. These peanuts were always packed with newspaper in a pyramid shape. Nowadays, there are hardly any hawkers left selling boiled peanuts…so sad when I think of so many disappearing culinary culture. You sure your not from Hawaii??? Boiled peanuts are a very popular snack here. A gorgeous photo! I haven’t encountered green peanuts yet. Your description of their addictive nature and the brine has ignited a craving before a tasting. I must find some. Marc, that’s a gorgeous presentation. I’ve never had green peanuts. 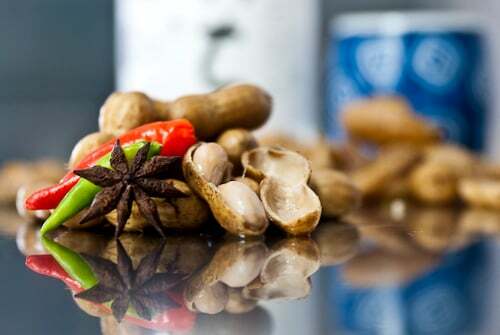 But the idea of freshly-boiled peanuts with an ice-cold beer would be a welcoming experience. As a native Southerner (USA), I have been enjoying boiled peanuts for most of my 67 years on the planet. Of course they are iconic in the South Carolina and in Georgia. However, I don’t think I would like the asian spices. We always use Cajun spices in ours. Like Doc, I’m a native of the south – S.C. and G.A., as a matter of fact! – and I have fond memories of summers spent on the front porch swing at my grandparent’s house with a huge pot of boiled peanuts. My grandfather, a peanut farmer, made them frequently with nothing more than salt. Not only are they insanely addictive, but boiling them brings out a lot of the natural antioxidants that peanuts have, which means this method is way better than roasting them, when it comes to health! Curse my peanut intolerance! I’d love to taste this but it may require a side of antihistamines. Usually, whenever I come across an interesting recipe that calls for peanuts, I simply substitute another nut but I don’t think that strategy applies here. Nevertheless, these boiled peanuts sound marvelous! I adore boiled peanuts. Growing up my mother would cook them in salted water. Definitely have to try your recipe! Am beyond intrigued. Not sure where I could find fresh green peanuts but dammit I’m gonna look. Also, completely sucky that you were sold spoiled meat! Is that even legal? I’m also chiming in from the South to say that boiled peanuts are Everywhere down here. I’ve never been a fan, honestly, but flavoring the brine makes so much sense. I tend to brines/broths to flavor all sorts of items; thanks for helping me generalize to these wee little guys. Boiled peanuts sound like an African snack, like something spicy and Maggi-salty to have with a snappy beer. all time favorites when i was still living in indonesia, haven’t had them for ages though. note to self: buy raw peanuts and try marc’s recipe over the weekend. i am trying to imagine how this would taste – other than delicious. My mom loves peanuts. she brings them back from shanghai in vacuum sealed bags for the suitcase full. When we don’t come home she only eats peanuts. You don’t have to yell at the Whole Foods butcher, but you really should have returned that meat for a refund. I got sold some bad fish by my local supermarket and got double my money back. Whole Foods should at *least* refund your money! This is amazing – I would never have thought of boiling peanuts! Your photo is fantastic too. I have never boilded peanuts and I bet my hubby’s mom would love for me to do some, since she is nuts about these nuts…I have always had them at ball games…already cooked. Great photo by the way! My husband eats raw peanuts to get more much-needed roughage in his diet. Also, he believes them to increase potency, though I have serious doubts about that. I prefer my nuts roasted. At home, we always boil peanuts. It’s the perfect snack. BUt I never add any spices like you, it’s a great idea. Next time, I’ll add the chiles, garlic and star anise. I’m sure some added flavors wouldn’t hurt. Thanks for sharing. Great photo! Have you invested in a macro lens? What surface are you shooting on to get such a nice reflection? Nope, I wish:-) It’s just the same ‘ole 24-70mm f/2.8. The surface is the same stainless steel chef’s table I shoot 90% of my photos on. It get a cool semi reflective effect when I line the lens up with the table surface because of the bokeh.